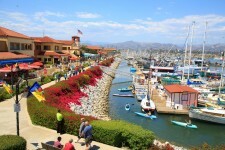 Ventura Harbor Village, California’s seaside playground, offers visitors the best of waterfront attractions, fresh seafood, boutique shopping, studio art galleries, water sports, boat and kayak rentals, live entertainment and monthly festivals. A beautiful walking promenade extends for over a mile on the waterfront in front of more than 15 Harbor restaurants, and over a dozen shops. Family fun awaits with a Village Carousel & Arcade open daily year round, the largest fleet of pedal boats to explore the Harbor, home-made waffle cones and ice cream, French pastries, homemade fudge, salt water taffy, a kite and toy store, and hats for all ages. From live music, to festivals, to nightly comedy club, and Greek dancing – Ventura Harbor Village is a must see Ventura destination. Pirate Days is an annual family event in July and Parade of Lights and Fireworks engages visitors with a show of lights on the water and in the sky in December each year. Get on the water, with a Harbor Boat Tour (weekdays/weekends Summer and weekends only in Fall/Winter/Spring). Or rent daily- kayak and stand up Yolos and Nalu board rentals, electric boat rentals, pedal boat rentals. Experience the ocean further with dive lessons and dive trips, sport fishing, whale watching, and island trips. Immerse yourself in the thriving working Harbor as the Ventura Harbor Village is home to Central Coast fisherman and a major port for squid offloading and is the headquarters for the Channel Islands National Park and Visitor Center. Parking and entrance are free at both Ventura Harbor Village and at Surfer’s Knoll and Harbor Cove beaches located directly across from the Ventura Harbor Village. Ventura Harbor Village is pet-friendly, offering pet-friendly dining patios, pet-friendly beaches, doggie bags, a doggie photo board, pet-friendly hotel, and walking promenade.